This image shows the treble clef. It is good for controlled coloring practice. Teach your kid about the note and have him or her learn the name from the picture. Music is divine as it is not bound by language. This is the reason why music can be understood and appreciated even by small kids. When children are first taught rhymes, they remember the music even if they don’t understand the words. So, providing some music lessons to your child is a great way to enhance her senses and boost the development of brain. Teach your kids about another instrument, the trumpet. This page shows the trumpet playing and various notes surrounding it. You can make the coloring activity engaging by playing a small trumpet to get your kid familiar with the sound. Meet the singer with the high notes. A person is holding a book and singing from it, with notes emanating loudly. It’s a fun filled picture; especially the open mouth of the person is hilarious. 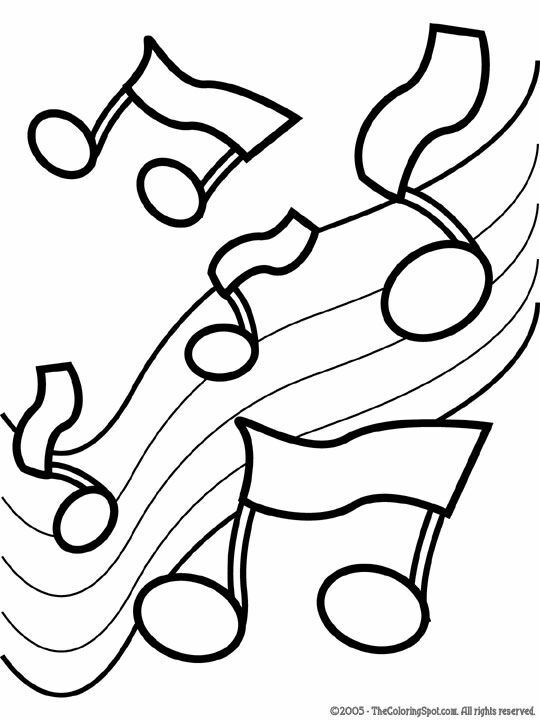 Music notes are interesting subjects to feature on coloring pages. Music and art both are integral to develop a child’s creative faculty. Music notes like treble clef, clef, etc are fantastic ideas for children to color as they will be amazed by the bold and simple symbol. These coloring pages feature signs used in musical notation to represent the relative duration and pitch of a sound. The pages can be based on individual notes or a group of notes.With the notes, kids can also learn alphabets.These pages can be given to kids before they take on a proper music lesson, so that they know the names of the notes. These music notes coloring sheets will make kids familiar with the concept of music. It will also make it easy to grasp the notes once they start learning about them. This picture will give a lot of chance to your kid to be creative while coloring. The children in the choir, their dresses and shoes can be colored innovatively by your kid. Inspire children to form a group of their own and try singing some simple songs or rhymes. Here is another instrument to greet your kid. The picture shows a large piano, with a smiling face and popping eyes. It seems to be dancing to the tunes. Tell your kid to identify the instrument. Kids will find this really interesting to color. The eighth note is here and it has a smiley face. Along with the note, its name is also written, which your kid can learn and practice to write. Here are some notes floating in the air. There are some instruments along with the notes. Teach your kid about the instrument while he or she colors it. If you work in sync with your kid while he or she colors, then this exercise will be beneficial for instilling a sense of music in them. Teach your kid about notes and instruments. These coloring pages show the distinct symbols of the world of music and melody and are fun to color. It’s turn for the quarter note to get expressive. The quarter note is alone here and is looking up from the image with wide eyes. Once the image is colored, ask your kid to learn and spell the name of the note. The singing guitar is producing a range of notes. The funny face of the electric guitar will attract your kid. Give them a toy guitar to start with, which they can play after they color this one. Visit DLTK’s music section for all kinds of themed crafts, games, songs and printables. This image has quite some notes playing in harmony. 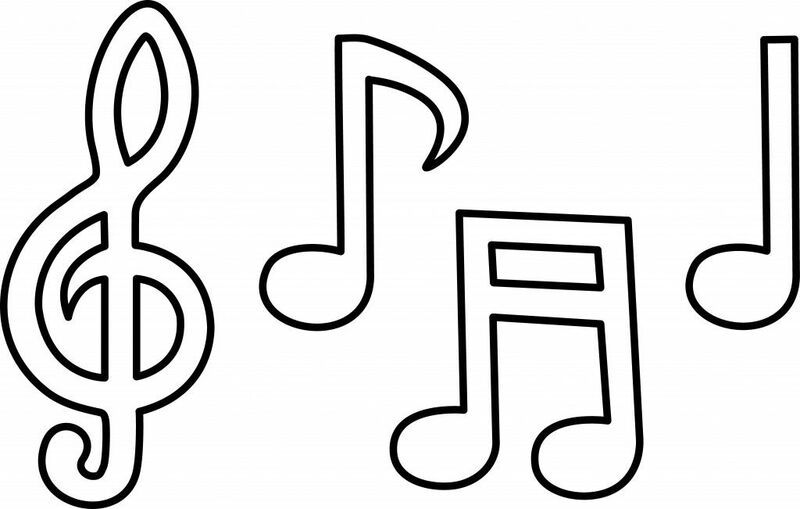 The G clef, eighth note, beamed note and dotted note are all present. You can teach about these different notes as your kid fills in the colors.